My fifteenth guest star is also my first featured boy (because Lawless doesn't count as a guest star, he's a bogger in his own right!). Said boy (fine, he's actually a man) goes by the name of Azazeal Whitfield, and he doesn't make clothing. First, just what is an Azazeal? I had to look up such a rich and interesting name. Wikipedia (source of all my knowledge) says that he is one of the Grigori, "a group of fallen angels described in Biblical apocrypha who mated with mortal women." Mm, a fallen angel, eh? A naughty one, too. 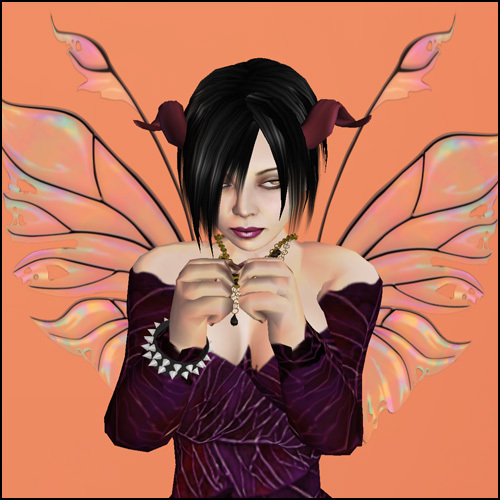 So far I've blogged women who make skins, hair, eyes, shoes, and pretty outfits, but I've never blogged a Arch-angel-itect. 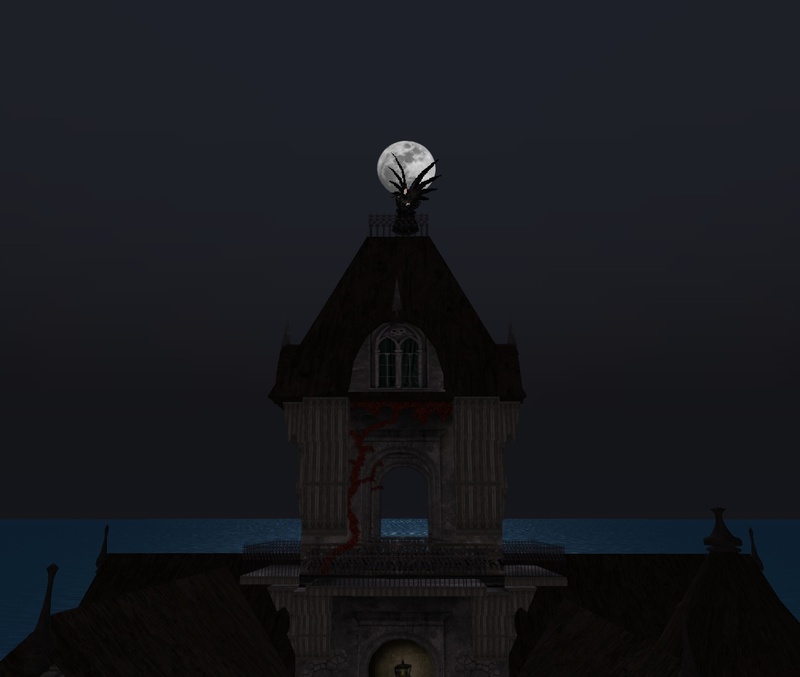 Azazeal is obviously a creature of the night, and Azazeal's architecture is the haunting counterpart to his avatar's look. I wandered through some of the builds of his firm, October Rust. They are spare of design, meant to be nice to your prim count. Despite this, they are still evocative of a mood, a feeling, as if your avatar has been sent to a pretty house's distant future, in which the family that made memories there have long departed. Only the faded wallpaper can tell the tales created within. Azazeal is not only a naughty fallen angel, he's a cheeky one as well. I gave him my usual round of questions about inspiration, perspiration and design aesthetic, and he said, "Aesthetic? Or anasthetic? I use wine.. lots of wine." The real answer was, "From gothic decay to pretty french governess; movies, comics, MUSIC an things I see in the real world; people I meet." The dark angel has built a lot of houses, so many that he's not quite sure how many, including gazebos and hearses, all in just under a year. 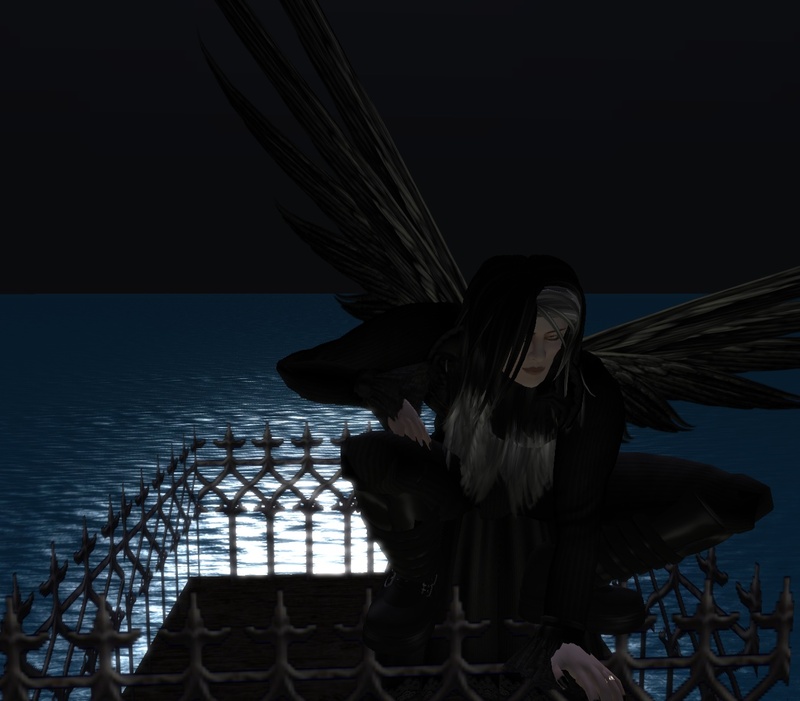 (Damn, I've been on SL for about as long, and the sum of my creation is still a one-prim box!) He also uses wine and concentration when building houses, and says that the build can never be forced: "If I actively try to build something I have a hard time and end up deleting stuff. If I just have an idea and start work, things tend to flow well." From the look of his haunting manors, the ideas must flow very well indeed. and a Silent Sparrow suit. I had a conversation with Giuseppe the other day about wings. Giuseppe is radically unlike myself in the way he plays Second Life. He's been around for a few years, lives in the Wastelands, and spends most of his time building interesting things like Second Life card games and big broken-down gameshow arenas. For his card game, he found a picture of n00b Ach in wings. "Wings are a newbie thing, aren't they?" He chuckled. Actually, yes and no. The amazing shininess of Second Life hits people as they enter and they immediately play with the fantastical elements of it -- like flight, and wings, and super-enormous mechas (*cough* yes I own a huge mecha av, don't you?). Wings were my first really awesome freebies, and I wore them around everywhere. Wings came with this lyrical dress from Fancy Fairy. They're beautiful and accentuate the autumn leaf color and design of the frock. Wings might excite newbies because of their fantastical shininess, but they still excite me after (nearly) a year. Who doesn't dream of being Titania, dancing in the wild woods? I just noticed the Fancy Fairy post that mentions that today is Wing Fling! I totally planned this. Really. ***Shoes: I'm totally wearing an incredible pair of shoes under this but since they're hidden I'll KEEP THEM SEKRIT! Might as well call me "Bootsy"
It is me. I am once again wearing boots. I went through a small crisis yesterday where I actually didn't post! I spent the time pondering the fact that it's tough to always write about new items and still maintain my avatar's essential look. I know that the fashion world of SL is interested in the new and shiny (and hell, so am I), but I think I've got to start wearing certain old things over again to be true to my vision of an SL "me." Clothing is the symbolic representation of one's subjectivity, after all! Deep thoughts, eh? Anyway, did I mention that I'm once again wearing boots? These are new and shiny releases from four different designers. They're all vastly different in aesthetic, unified by the fact that they're all boots! I have to laugh about the fact that all of these boots are actually very different. The first pair, 713's Stompy Zeppelin Boots, inspired the outfit. I'm wearing conductor pants! I found them at Gigi Couture while shopping around Cherry Buttons. They've got all kinds of colors of these pants, but the striped ones most inspired me to sing "I've been workin' on the railroad, aaaalllll the live-long daaaaaaay." 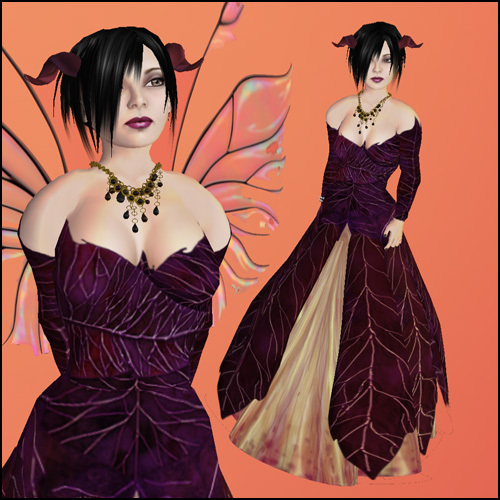 The dolly shape from All Dolled uP is perfect for skins that border on the lush and macabre, and this skin from Ravenwear is no exception. I like the way in which the hand-drawn lashes accentuate the dolly's large eyes, and the way the mottle-colored lips look as though she's been thoughtfully chewing beetles. Mmm, juicy and full of protein. Speaking of beetles, I've actually consumed silk worms, fried, in Chiangmai while visiting some relatives. They were tasty, especially deep-fried in curry batter. The internal consistency of silk worms is much like walnuts. Gustitorial diversions aside, the dolly shape also sent me hunting for a short skirt to properly show off a dolly's chibi proportions. 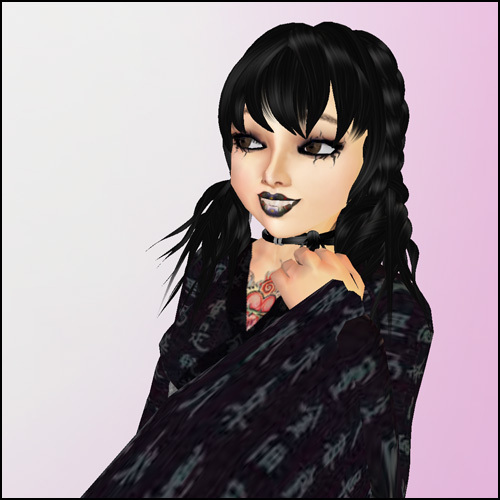 I asked Tomo, who pointed me to the correct area of Falln, and I found this adorable wee dolly kimono. Jackal once again helped me fit the waist prims -- the woman has a prim editing addiction! -- and I was all suited up for a gothic Japanese girl's day (granted, a month-ish late). A kindly friend has been following my "boots with stuff on them" posts, and decided to test my skillz. She handed me the boots in question and I swallowed hard, realizing that my reputation was at stake. These boots have it all. They have optional blood. They have rope. They have rawhide. They have a small dead bear. They have everything but a 'shoe' attachment -- that's right, these boots are actually cleverly disguised socks. The best part about these boots is their sense of humor. Is an outfit really necessary with these boots? I put on as minimal an outfit as I could, because really, nobody's gonna be looking at your face. So here, as proof that I will indeed wear any kind of boot with stuff on it, is my post. Fear the boot -- I do! Japancakes store freebie -- button headband for furry and three human sizes! The cuteness that is Japancakes has definitely found a niche to fill, and it is adorable headgear for furries. What's more, this headband is totally free, and comes in one furry size and three human sizes. The buttons echo the aesthetic that I see in Japanese shops across the grid, fusing natural colors and found objects into appealing and very wearable shapes. That's why it goes so well with *THE CLOSET*'s latest release, a tiny little spring tunic that lets your tail flap in the breeze. So what do you think? Am I a more naturally a wolf or a reindeer? I'm still seeking my animal daemon, but nothing has really hit me as the ultimate "me" yet. Ever have one one of those RL days that seems designed to interfere with whatever you were doing in SL? Darn that RL and it's JOB and stuff. Granted, I absolutely love my job (teaching preservice teachers), but I really wanted to post about this apple-cheeked wonder of a skin! ***Earrings: *THE CLOSET* Gypsy earring set from the Albero gift hunt. Of young Ach, discovering a strange sci fi book at a used bookstore in Hawaii, Utopia Hunters. When I read it it was above my head, all about Marxism and vast decadent courts that pursued utopian societies only to destroy them (for their own good, of course). Old Fashioned did a lovely post about this suit too! Continuing my fixation with boots with stuff on them, here's a pair that I found while trekking around Mooncat Izumo on the recent treasure hunt. These boots have it all! Copper plates to protect you from stray pebbles, little rabbit heads whose ears have bubbling vials of plutonium, even bling! I removed the bling, but there might be something to be said for evil blinging bunny eyes staring out from your calves. These are truly post-apocalyptic cute, the perfect outfit for watching Akira or Last Exile. My drow says she'd rather watch Wolf's Rain, for, you know, the violent gory bits. ***Earrings: .+*Atelier AM*+. Wood cube earrings from the freebie hunt posted about here. ***Boots: **-- J's -- at Umi Usagi E-TANK No6 Rabbit Boots BK 299 BOX -- they bling, the bling script is located in the left-hand eye of each little rabbit. The script can be removed and a no-bling placed into it (thanks, Jackal, for doin' this for me! ).